A naturally occurring metamorphic rock, slate comes in a range of colors and textures. 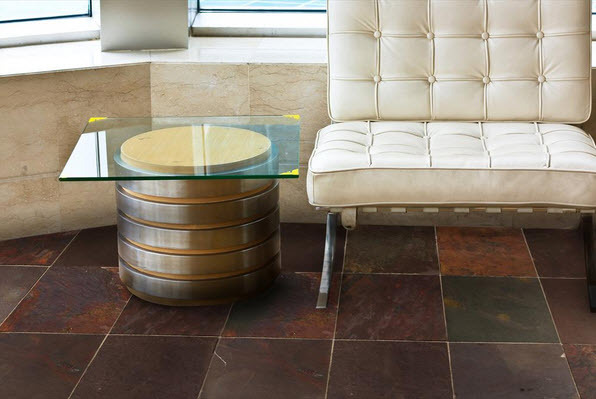 Due to its durability and look, slate is a unique material for tile flooring, pavers, and cladding. Here are some important glossary terms to know to help you buy slate tile more intelligently. Roterra Slate Tiles Multi Raja flooring from BuildDirect. Calcite: This is one of the most common minerals found in slate. Calcite is a naturally occurring substance that can be bound together with other minerals to form slate. Cleft: Slate tiles have two very different sides. The back side is typically machined so that it’s smooth and easy to install. The front has natural cleft, or texture, a remnant of its split from the larger stone. Gloss: Many homeowners opt to add a gloss coating to their slate flooring. While this isn’t required, it can add a little extra shine to a pristine floor. Gloss also protects the natural color and texture of slate tile. Most gloss coats must be reapplied several times a year to maintain a consistent look and shine. Grout: Grout is the binding substance that goes between each slate tile. It holds the tiles in place and helps prevent moisture from seeping into the tiles. Grout is available in dozens of colors, so look for one that complements the tile and the room. Mortar: This concrete-like substance, which is made of sand, water, and a binder, holds slate tiles in place. Before laying out slate tiles, you’ll need to spread a thin layer of mortar across the surface area. Sealant: Not all flooring or tile types require sealant, but slate does. Sealant helps both slate tile and the grout between the tiles to keep moisture out and keep from absorbing stains so easily. Some sealants also lend a slight shine to slate tiles. Spacers: One of the most important elements in installing floor or wall tiles, spacers provide even spacing between each tile. It’s important to put the spacers in place when laying the tile and remove them once the mortar cures. Tile nippers: This hand tool allows you to remove small pieces of tile manually. When you use a tile nipper, the tile edges won’t be as smooth and even as they once were, but the tile will meet your size and shape demands. Be sure to wear eye protection when using tile nippers, as small particles and pieces can fly into the air and damage your eye. Trowel: Slate tile installation requires both a notched trowel and a pointed trowel. Notched trowels, with their flat surface and handle, are handy for spreading and smoothing mortar before placing tile. Pointed trowels, with their narrow tips, are good tools for adding grout between tiles. Wastage: When ordering slate tile, it’s important to order slightly more than you need so you don’t completely run out before completing the job. While the color and texture of tiles in one lot is usually relatively consistent, tile can vary significantly from lot to lot. Before you start the installation, calculate the wastage for your project to know how much tile you’ll have to waste due to unique size and shape requirements.